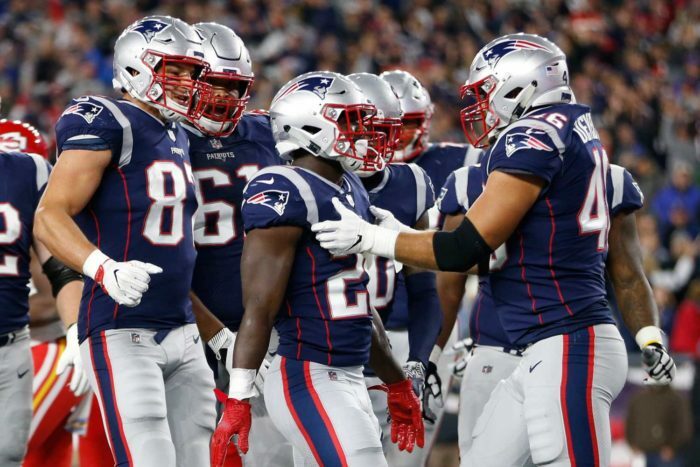 • The Sunday night matchup between the Kansas City Chiefs and New England Patriots lived up to the pregame hype, as a very entertaining game went down to the wire and the host Patriots kicked a game-winning field goal in the final seconds. It was career victory number 282 for Bill Belichick, and it showed us another reminder why he is one of the all-time greats. After New England blew a 24-9 halftime lead, Kansas City began having defensive success rushing only three and playing coverage. The Patriots found themselves trailing 33-30 midway through the fourth quarter, but the offense stayed patient. The running game had been successful throughout the game, and Belichick didn’t abandon it. New England came right back with a TD to regain the lead. This kind of patience is rare, and it showed Belichick’s level of confidence in the ability of his offense to execute. • New England is one of the few teams in the NFL that regularly utilizes a fullback. In fact, James Develin might be on the field more than any other fullback in the league with the possible exception of San Francisco’s Kyle Juszczyk. No other team lines up in I-formation as much, either. Most teams feel they might be more explosive playing without one, but New England’s attack seems to be working just fine. Develin plays a lot of snaps and his presence gives the offense its versatility. He also was targeted twice Sunday night. For the season, he’s caught six passes for 25 yards. • Credit Ben Roethlisberger and Antonio Brown for hooking up on the game-winning touchdown in the closing seconds of their AFC North battle with Cincinnati. But the Bengals defense deserves an assist. With only 15 seconds left and down by one, the Steelers were looking at a 48-yard field goal try if they couldn’t gain any more yards. Considering the wet weather conditions, that was certainly no lock. So why didn’t the Bengals stay in their base defense? Instead, they took a chance and blitzed Roethlisberger. That decision opened up the middle of the field for Brown to win it. • We’ve said this before but it bears repeating: The Los Angeles Rams offense is so good right now that they really don’t need much play variety. Their execution and talent is so good that they can run the same plays over and over until someone stops them. Nobody has yet. One thing to consider is that while the defense has sustained a few injuries, the Rams offense has remained healthy. Receiver Cooper Kupp had an injury scare Sunday but returned to the game. As long as they stay healthy, the Rams offense is not only explosive but also very efficient. • Blake Bortles has not been the only issue in Jacksonville’s recent slump. The young and talented defense – considered one of the best in the NFL coming into the season — has been carved up the past two games. Breakdowns in the secondary and in the run game allowed the Dallas Cowboys to put up 40 points Sunday. The defensive line could not get consistent pressure on Dak Prescott as he had time and threw the ball with confidence throughout the game. With a key divisional showdown against the Houston Texans next week, Jacksonville needs to get back to controlling the line of scrimmage on both sides of the ball. • Going into their game last Thursday night, the Giants surprisingly had a slightly better third-down conversion rate than the Eagles (40 percent for the Giants; 37 percent for the Eagles). Those numbers flipped considerably in Philadelphia’s 34-13 win. Carson Wentz and the Eagles converted nine of 16 third-down attempts; Eli Manning and the Giants were 4-for-14.